One of the most iconic islands in Greece, Mykonos is a glamorous destination for people who want to party, stay in luxury hotels and recline on long stretches of golden beach. 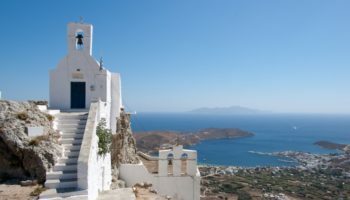 But there’s more to Mykonos than just glitz and glamour, the island’s culture remains strong and there is a lot to explore on this alluring island. Mykonos’ charming white buildings, labyrinthine ancient streets and delicious spectrum of Greek cuisine means the island has lots of hidden gems that are waiting to be explored. Mykonos is well known for its fantastic beaches; some are perfect for families, with gentle shores and soft sands, while others are all about night-long parties where you could be dancing alongside a celebrity or two. 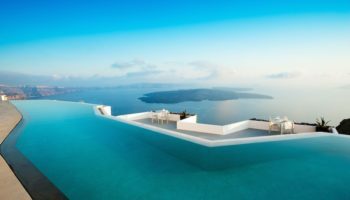 Many of the best places to stay in Mykonos, especially in the more popular beach resort towns, are high-end and luxury hotels, with stunning suites or private villas, and views of the turquoise sea along with world-class restaurants. Don’t despair: if you are traveling on a budget, there is still accommodation to suit you. Here are the best places to stay on the glistening, glamorous and enchanting Greek island of Mykonos. Whitewashed houses with domes painted in eye-popping blue, ancient wooden doors, old stone lanes, charming churches and vines of purples flowers – Mykonos Town is a picture of Cycladic architecture. It’s easy to walk around the center of the island’s capital on foot, as much of it is closed to traffic. The town has grown cosmopolitan in culture; the beach is scattered with eateries and deck chairs, whilst designer boutiques, art galleries and souvenir shops sell their goods to tourists venturing in to firm land from the visiting cruise ships. Decadent cafes and bars edge the tiny streets and, as night falls, the town hots up with party-goers arriving to meet with friends and dance the night away at one of its many night clubs. There are several different options for accommodation in Mykonos, but much of it is mid-range and luxury, with private pools that overlook the ocean. Belvedere Hotel – Walking into this hotel through the gates in its stone clad walls feels like you’re really entering a realm of luxury. Set across seven gorgeous whitewashed buildings and with minimalist Cycladic style rooms (most of which come with stunning sea views), the Belvedere Hotel Mykonos also boasts a branch of the world-renowned Nobu restaurant, as well as three vibrant cocktail bars to choose from. This 5-star option is just a six-minute walk to the iconic Mykonos windmills. Vencia Boutique Hotel – With its infinity pool overlooking the sea – complete with a bar – Vencia Boutique Hotel is where to stay if you feel like getting away from it all and simply relaxing. With breakfast included in the price, the stylish rooms on offer at this chic hotel boast private verandas with sea views. Getting around is easy too, with a ferry terminal just a few kilometers away that has services to Paros and Naxos. For a slice of culture, the Church of Panagia Paraportiani is just a 15-minute stroll away. Hotel Alkyon – If you like to be near to the amenities of a town, but far away enough to feel secluded, then Hotel Alkyon – just 10 minutes on foot to Mykonos Town – is a great option. This 4-star offering comes complete with its own pool to splash around in, as well as spacious, airy rooms. It also boasts a bar where you can relax with a drink before heading out into the nightlife of the town. Fancy island hopping? Mykonos ferry terminal is one kilometer away. Poseidon Hotel Suites – A whitewashed hotel with a relaxing atmosphere, Poseidon Hotel Suites is well located, with the Mykonos windmills a few minutes walk away and the Archaeological Museum of Mykonos within easy walking distance, too. The outdoor saltwater swimming pool here comes complete with sun loungers to chill out on and a bar for a few drinks. You can relax with a beauty treatment or a massage, or even book a boat trip with the hotel. 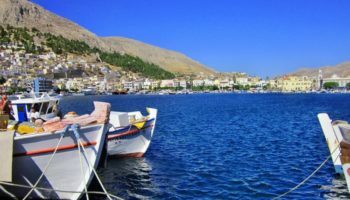 The quiet village of Ornos is nestled upon a busy harbor, where working fishing boats and luxury yachts sit side by side. The village is situated between two pristine beaches, one with calm, turquoise waters, great for sunbathing and swimming, and the other is popular with kite surfers due to its high winds. 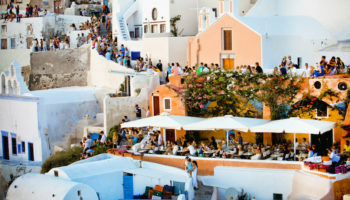 The streets of the village are home to taverns and hotels which are more high-end, but away from the hustle and bustle of Mykonos Town, which is only a short taxi or bus ride away. Mykonos Blanc – An easy stroll from the lovely Ornos Beach, this 5-star hotel has it all when it comes to beachfront luxury. There’s a chilled beach bar to enjoy after a spot of lounging on its private slice of sand, three restaurants to choose from when you’re hungry, as well as a gym and a spa. The rooms are done in an elegant Cycladic style. For even more luxury, you can opt for a two-storied villa so you can really spread out and relax. Mykonos Essence Hotel – With the beach within walking distance, Mykonos Essence Hotel is also close to the amenities of the town, meaning there are restaurants and bars galore just on the doorstep. Back at this 4-star hotel, there are clean, spacious rooms and an outdoor swimming pool, as well as a snack bar for when you get peckish after a spot of swimming. It’s also just a mere three kilometers from Mykonos Airport, meaning getting on and off of this island (and to the hotel) is a piece of cake. The cosy village of Platys Gialos sits in an elegant crescent bay. Its stretch of pebbly beach is the longest on the island and attracts holidaymakers who want to spend their days reclining on sun loungers. The beach also offers the opportunity to try out some fun watersports and boat rides to nearby islands. In the evening, restaurants on the beach play music and locals sit alongside visitors in the welcoming, relaxed atmosphere. 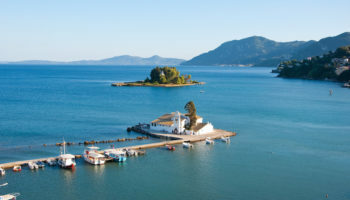 Many of the hotels in Platys Gialos tumble right onto the beach and come at a cost, but cheaper apartments can be found further into the village. It’s simple to reach Mykonos town by catching the bus from Platys Gialos, which takes just 10 minutes. Nissaki Boutique Hotel – Overlooking the beautiful Psarou Beach, this chic 5-star hotel definitely lives up to its boutique name. Staying true to the Cycladic style of the island, the buildings here are whitewashed and minimal and look just perfect against the backdrop of the glittering sea. Easily one of the most picturesque hotels on the island, this place also boasts friendly, professional staff that will help your stay be as perfect as can be. The beach of Platis Gialos is mere minutes away on foot. Casa Grande Hotel – Another beautiful example of a hotel doing it right when it comes to the Cycladic style that Mykonos is known for, Casa Grande Hotel blends modernity and custom-made design details with charm and tradition. 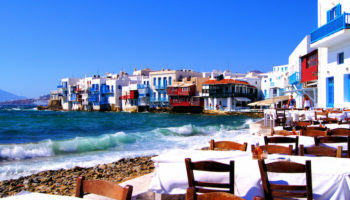 Close to restaurants and the beaches of town, there’s also a nearby bus stop that can easily get you into Mykonos Town. This stylish hotel features a lovely outdoor pool and a delicious breakfast to tuck into each morning. Argo Hotel – This gorgeous hotel is close to the blue-flag beach of Platis Yialos (328 feet away, to be exact) and features traditional hospitality as well as comfort – all in a cool, block-style Cycladic setting. More beaches on offer include the nearby Paranga Beach, and for those who want the buzz of a lively urban center, Mykonos Town is only five kilometers away; it is easily reached using public transport or your own set of rented wheels. 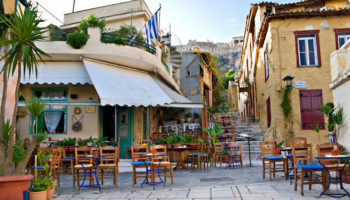 For something closer, there are the restaurants and bars of Platis Gialos to discover. Little Agios Ioannis is a welcoming village built in the shape of an amphitheater around its stunning sandy beach. A great spot for a family holiday, the beach is quiet and low-key, with less of the buzz of neighboring beaches, so if you are looking for some time-out, Agios Ioannis is the village for you. The islands of Delos and Rheneia are nearby and can be seen in the distance. If you are a culinary fiend, the village has some delicious offerings in the local restaurants that are found along the picturesque streets, alongside a mix of hotels and accommodation which offer something for everyone. Anax Resort and Spa – Featuring a stunning infinity pool that overlooks the turquoise blue of the Aegean Sea, as well as an upscale restaurant and several bars to drink at, there’s no end of choice when it comes to living the good life at this luxury hotel. The beautiful rooms come with whirlpool tubs and sea view balconies but opt for an upgraded room for your own plunge pools and sun loungers. There’s free parking here for those exploring the island by car, and the sumptuous breakfast buffet is also complimentary. Lithos by Spyros & Flora – Lithos is an upmarket option with rooms that feature the perfect blend of style and comfort. They’re also quiet, meaning you can get a good night’s sleep. A family-friendly option, the staff here are excellent and will help you with anything you might need during your stay. There’s a pool for you to play in (or simply laze around), plus there’s a bar for evening drinks. The beach is nearby, as is public transport for further island exploration. If you are in Mykonos to party then you should probably hit up Paradise Beach. Home to two clubs, the beach is popular with holidaymakers who want to sip martinis and dance the night away to big name DJs. In the day, beautiful people parade to the beat of low-key music and then, as evening falls, clubbers descend to dance until dawn. Paradise Beach is all about the fun-filled atmosphere and the good times. Choosing to stay in the heart of the party scene will mean you have the choice of staying right on the beach at one of the high-end hotels, or further away in a lower-cost apartment or bungalow. Paradise View Hotel – With its free airport shuttle and laid back atmosphere, Paradise View Hotel is a great option for a simple stay in Mykonos. The rooms here might not be the most luxurious but they’re clean and minimal – and moreover, comfy. There are room options that feature private balconies with sea views. Elsewhere, there’s a chilled cafe (where you’ll chow down on the breakfast buffet), which also features a relaxed terrace and a bar. It’s two kilometers from here to the buzz of Paradise Beach. The long, white stretch of sand that is Elia Beach is a fun and laid-back spot. With only one restaurant in the town and a maze of traditional Cycladic houses, the charm of Elia Beach lures many to its crystal clear waters. The beach has a liberal atmosphere and is gay-friendly as well as being popular with nudists. Although it can get busy, it is much quieter than nearby villages, as it is the last stop on the water taxi from Mykonos. Accommodation near the beach is made up of luxury, designer boutique hotels which come with all the amenities you should need to make your stay as comfortable as possible. Arte & Mare Luxury Suites – Imagine tucking into a delicious breakfast each morning on a seafront terrace. Well, you can do that at this luxury hotel. Practically on the beach, Arte & Mare Luxury Suites also features a beach bar and a relaxed restaurant. There’s an outdoor pool to enjoy, as well as spa treatments and even a hammam (Turkish bath)! Some of the rooms come with their very own saunas for that added touch of extravagance. If you can bear leaving the hotel, this place also runs boat trips. The little coastal village of Tourlos is the picture of Greek charm, with boxy white houses, colorful shutters and fresh flowers. The village’s sandy beach is a great spot for watersports and swimming next to the popular new harbor, where you can catch a boat to other destinations on the island. The once sleepy village has become very popular recently and has grown quickly, with a wide choice of upscale accommodations to provide for the stream of wealthy visitors coming to its shores. Many well-known celebrities have made Tourlos their second home and built impressive villas in the area. Olia Hotel – From the relaxed setting of Olia Hotel, it’s easy to get to both the center of town and the nearby beach – the vibrant Agios Stefanos. For a touch of luxury, you can lounge around the pool and order bar service as you relax in the refreshing water. Elsewhere at this 3-star offering, the rooms are airy and spacious – some have sea views and balconies, others feature their own private terraces and dining areas. As a bonus, there’s also a complimentary breakfast on offer. The most famous party beach on Mykonos, Super Paradise Beach should probably be renamed Super Party Beach. Staying near Super Paradise Beach would mean a 24-hour party, which is a big draw for people who want to let their hair down. Sip cocktails by the sea and rub shoulders with celebrities on the golden sands as the blue ocean laps the shores. 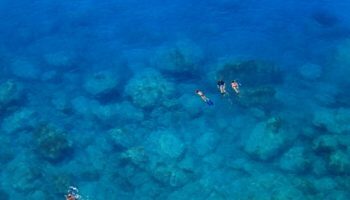 The beach is also famous for its gay scene and for being one of the most beautiful spots in all of Greece. Accommodation in the area is mostly made up of luxury villas and boutique hotels, which attract a glamorous crowd. You can catch a taxi boat from Super Paradise Beach to other popular towns or just take the local bus. Super Paradise Suites & Rooms – True to its name, this hotel is situated very close to the busy Super Paradise Beach, so you’ll never be too far from its buzzing atmosphere. This Cycladic style offering features a cool open-air restaurant, a terrace for soaking up the sun, and a bar for a few drinks before heading out and discovering the restaurants and bars nearby. For a spot of relaxation, this hotel also boasts massage services, too. Kalafatis town’s golden beach is a big draw to visitors who want to spend their break splashing in turquoise waters. One of the most attractive beaches on the island, Kalafatis is a magnet for windsurfers, who enjoy the strong breezes. There is also a whole range of watersports to try out. 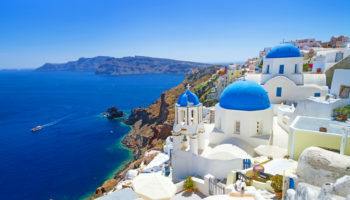 The town has many family friendly hotels at mid-range prices and many bars and dining options where you can try out Greek dishes. There is a bus that runs throughout the day connecting with Mykonos Town. Anemoessa Mykonos – Stylish, Cycladic and whitewashed, Anemoessa Mykonos isn’t just a luxury hotel, it’s also a great place to come if you’re planning a wedding. There’s actually a beautiful chapel here that overlooks the sea! Elsewhere, you’ll find two stylish restaurants to choose from, as well as two bars and a cool outdoor pool area. This chic hotel is a 15-minute walk from Kalafati Beach, making it easy to spend a chilled day on the sand without renting your own vehicle. Kalo Livadi is a peaceful community made up of local farming families. Set in a valley, hotels and holiday villas have sprung up here, with holiday makers enjoying the town’s long sandy beach. The rural town is family friendly and there are sunbeds and other facilities, as well as many watersports to try out. There are attractive taverns and low-key bars that are perfect for sunset viewing. Sit back and relax in the serene evening atmosphere as the sun dips over the horizon. Pietra e Mare Mykonos – Situated on Kalo Livadi beach, Pietra e Mare is a slice of compact luxury. Stay in one of this 4-star hotel’s stylish, minimalist rooms, complete with wonderful sea views (as well as some with Jacuzzis), and then have a beautiful evening dining in its upscale Mediterranean restaurant. At this four-star offering, you can snooze in one of the hammocks in the lush garden, spend time luxuriating in the pool, or simply wander onto the beach for some sun, sea, and sand. Much quieter than other places on the island, relaxing Ano Mera is less about partying and more about a slow pace of life. Located almost in the center of the island, there aren’t any beaches close to the village, which explains why there are less tourists here. 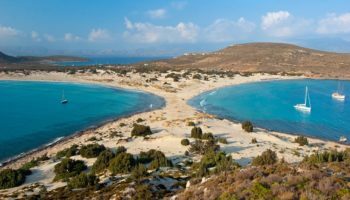 But don’t let that put you off, it’s only a quick bus ride to the hustle and bustle of the beaches in Mykonos town, or you could hire a car and explore the island’s beautiful coastline. Ano Mera is a great choice if your budget is a little tight. Choose from one of the hotels in the village that are small, family-owned and welcoming. There are some delightful local restaurants where you can dine alongside friendly neighbors and learn more about life on the island. Hotel Anatolia – Set in the impossibly charming village of Ano Mera, staying at Hotel Anatolia means the chance to wander around its picturesque streets and try out local bars and restaurants. Whitewashed and cubist in style, this chilled hotel features an amazing outdoor pool area; it boasts wicker sun loungers shaded by thatched umbrellas for a touch of unique style. 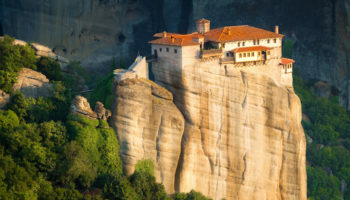 Though just four minutes on foot to the beautiful Monastery of Panagia Tourliani, motorbike rental is available to explore the island further. In the north of the island is picturesque Panormos. With a long stretch of beach, the tiny town is compact, family-friendly and low-key. The town’s sheltered coast and calm waters make it perfect for days spent splashing on the shores and making sandcastles with your family. 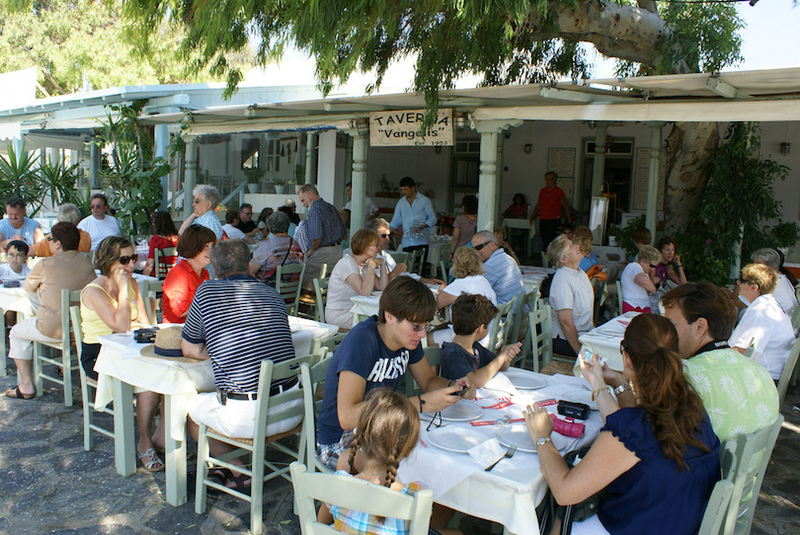 The village has a relaxed nightlife: families wander along the promenade and enjoy happy dinners in local restaurants and then grab dessert from a bakery. This tiny town gives tourists the chance to spend some time soaking up the Greek culture and the ancient Roman history of the island. Hotels in the area are varied and provide different options to suit everyone, from couples on a romantic getaway to young families on a summer holiday. Panormos Village – Panormos Village is a picturesque place to stay in Mykonos; the whitewashed buildings of this lovely hotel are drenched with greenery for a peaceful feeling. The rooms here are simple but large and feature comfortable beds as well as sea views. You can order a drink from the poolside bar and relax in the sun before trying out the onsite restaurant. Bike hire is also available, so getting to nearby sights – like the stunning Marathi Lake – is easy. Probably the best option on Mykonos for travelers on a budget, Paraga has a campsite and some hostels, which makes the otherwise very expensive island a little more affordable. The sunsets from the pebbly beach are spectacular and there are some fantastic diving opportunities just off the coast. The beaches here are very popular with tourists, so it does have all of the amenities you need to make your days in the sun fun. San Giorgio Mykonos – Utterly stylish, this bastion of luxury is a top choice for those looking to stay in chic surroundings on their Mykonos holiday. Its beautifully designed bohemian style rooms are minimalist, with white walls and furnishings, and feature quirky design touches like rustic hammocks to chill out in or luxury open-air lounges. The restaurant here is very cool and there’s also a juice bar at San Giorgio for a refreshing drink after a day in the sun. Paraga Beach is just a few minutes’ walk away. Small but beautiful, the little village of Agios Sostis is captivating. A 500-year-old chapel, after which the village is named, sits alongside the ocean, and is one of many other old churches in the village. The beach here is much quieter than others on Mykonos, but there are still beach bars and watersports to enjoy. The town is ideal for a couples holiday or a low-key family break. There are many delicious restaurants serving seafood and local dishes to enjoy together. 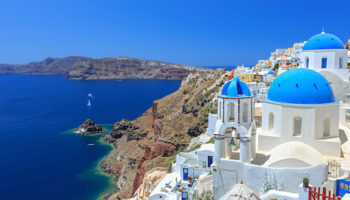 Plus the accommodation on offer is much more reasonably priced than the rest of the island, and is usually set in traditional white Greek villas. Mykonos Star – With dramatic views overlooking Panormos Bay, this family-run aparthotel comes complete with rooms that feature practical, self-catering facilities and a sense of beautiful design aesthetic. After settling into your luxury apartment, you can spend time chilling in the outdoor pool or enjoying a spot of delicious food at the open-air restaurant (featuring a sea view terrace). For beach fun, both Agios Sostis Beach and Panormos Beach are within one mile of Mykonos Star.